George Bryan "Beau" Brummell (7 July 1778 – 30 March 1840) was an iconic figure in Regency England and for many years the arbiter of men's fashion. At one time he was a close friend of the Prince Regent, the future King George IV, but after the two quarrelled, and Brummell got into debt, he had to take refuge in France. Eventually he died shabby and insane in Caen. 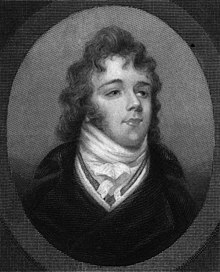 Brummell was remembered afterwards as the preeminent example of the dandy and a whole literature was founded upon his manner and witty sayings which has persisted to this day. His name is still associated with style and good looks, and it has been given to a variety of modern products to suggest their high quality. He progressed to Oxford University, where, by his own example, made cotton stockings and dingy cravats a thing of the past. While an undergraduate at Oriel College in 1793, he competed for the Chancellor's Prize for Latin Verse, coming second to Edward Copleston, who was later to become provost of his college. He left the university after only a year, at the age of sixteen. In June 1794 Brummell joined the Tenth Royal Hussars as a cornet, the lowest rank of commissioned officer, and soon after had his nose broken by a kick from a horse. His father died in 1795, by which time Brummell had been promoted to lieutenant. His father had left an inheritance of £65,000, of which Brummell was entitled to a third. Ordinarily a considerable sum, it was inadequate for the expenses of an aspiring officer in the personal regiment of the Prince of Wales. The officers, many of whom were heirs to noble titles and lands, "wore their estates upon their backs – some of them before they had inherited the paternal acres." Officers in any military regiment were required to provide their own mounts and uniforms and to pay mess bills, but the 10th in particular had elaborate, nearly endless variations of uniform; also, their mess expenses were unusually high as the regiment did not stint itself on banquets or entertainment. "the first gentleman of England", by the force of his personality. He was allowed to miss parade, shirk his duties and, in essence, do just as he pleased. Within three years, by 1796, he was made a captain, to the envy and disgust of older officers who felt that "our general’s friend was now the general." When his regiment was sent from London to Manchester, he immediately resigned his commission, citing the city's poor reputation, undistinguished ambience and want of culture and civility. Although he was now a civilian, Brummell's friendship with, and influence over, the Prince continued. It was now he who became the arbiter of fashion and established the mode of dress for men who rejected overly ornate fashions for one of understated but perfectly fitted and tailored bespoke garments. This look was based on dark coats, full-length trousers rather than knee breeches and stockings, and above all, immaculate shirt linen and an elaborately knotted cravat. Brummell took a house on Chesterfield Street in Mayfair and for a time managed to avoid the nightly gaming and other extravagances fashionable in such elevated circles. Where he refused to economise was on his dress: when asked how much it would cost to keep a single man in clothes, he was said to have replied: "Why, with tolerable economy, I think it might be done with £800." That amount is approximately £52,000 ($67,000) in 2016 currency; the average wage for a craftsman at that time was £52 a year. He also claimed that he took five hours a day to dress and recommended that boots be polished with champagne. This preoccupation with dress, coupled with a nonchalant display of wit, was referred to as dandyism. Brummell put into practice the principles of harmony of shape and contrast of colours with such a pleasing result that men of superior rank sought his opinion on their own dress. While at Eton Brummell played for the school's first eleven, although he is said to have once terrified a master there by asserting that he thought cricket "foolish". He did, however, play a single first-class match for Hampshire at Lord's Old Ground in 1807 against an early England side. Brummell made scores of 23 and 3 on that occasion, leaving him with a career batting average of 13.00. Unfortunately, Brummell's wealthy friends had a less than satisfactory influence on him; he began spending and gambling as though his fortune was as ample as theirs. Such liberal outlay began to deplete his capital rapidly, and he found it increasingly difficult to maintain his lifestyle, although his prominent position in society still allowed him to float a line of credit. 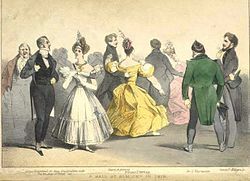 This changed in July 1813, at a masquerade ball jointly hosted at Watier's private club by Brummell, Lord Alvanley, Henry Mildmay and Henry Pierrepoint. The four were considered the prime movers of Watier's, dubbed "the Dandy Club" by Byron. The Prince Regent greeted Alvanley and Pierrepoint at the event, and then "cut" Brummell and Mildmay by staring at their faces without speaking. This provoked Brummell's remark, "Alvanley, who's your fat friend?". He lived the remainder of his life in French exile, spending ten years in Calais without an official passport before acquiring an appointment to the consulate at Caen in 1830 through the influence of Lord Alvanley and the Marquess of Worcester. This provided him with a small annuity but lasted only two years, when the Foreign Office took Brummell's recommendation to abolish the consulate. He had made it in the hope of being appointed to a more remunerative position elsewhere, but no new position was forthcoming. Rapidly running out of money and grown increasingly slovenly in his dress, he was forced into debtors' prison in early 1835 by his long-unpaid Calais creditors; only through the charitable intervention of his friends in England was he able to secure release later that year. In 1840 Brummell died penniless and insane from syphilis at Le Bon Sauveur Asylum on the outskirts of Caen; he was 61. He is buried at Cimetière Protestant, Caen, France. 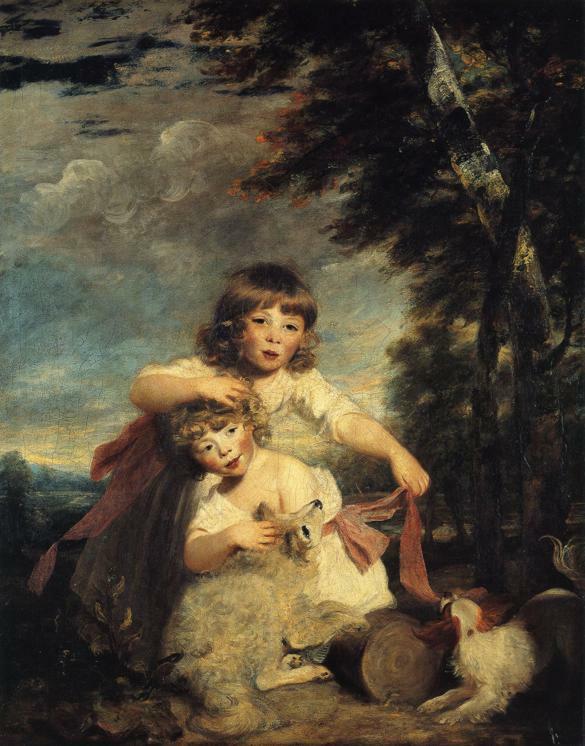 A very early portrait of Brummell, along with his elder brother William, occurs in the Joshua Reynolds painting of the curly-headed Brummell children, dating from 1781 and now in the Kenwood House collection. The caricaturist Richard Dighton painted a watercolour of Brummell at the elegant height of his dandyism and used it as the basis for a popular print in 1805. Two centuries later it served as model for a 2002 statue of Brummell by Irena Sedlecká erected in Jermyn Street. On the other side of Piccadilly, a blue plaque has marked Brummell's former home in Chesterfield Street since 1984, while in 2013 another plaque commemorated his name as a member of the hunting and dining club in Melton Mowbray also patronised by the Prince Regent. In literature, Brummell has been more extensively portrayed. Scarcely had he left England than he was satirised as the witty Bellair in the picaresque novel Six Weeks at Long's, by a Late Resident (1817), now ascribed to Eaton Stannard Barrett. Among his humorous remarks there, he is credited with denouncing the eating of vegetables and, when challenged whether he had ever tried it, replying "Oh, yes, I remember I once ate a pea." A collection of the witticisms ascribed to him and of anecdotes about him followed under the title Brummelliana and was republished many times in the following decades. This began with the story of his enquiring the identity of his companion's "fat friend" and also included his vegetarian remark. William Hazlitt borrowed the same title, "Brummelliana", for an unsympathetic essay published in 1828, referring to some of these stories and repeating others uncollected there. Dandyism also came under attack in George Robert Wythen Baxter's satirical essay "Kiddyism", published in humorous journals from 1832 onwards, which culminates in a set of satirical aphorisms purporting to be yet more Brummelliana. Further fictitious aphorisms were published in France by Honoré de Balzac in the course of a series of articles published under the title Traité de la vie élégante (1830). These sayings were supposed to have arisen during an interview with Brummell in Bologna, rather than Calais, and epitomise his view of "the elegant life". In the following decade two more books were dedicated to confirming Brummell as a cult figure. In England there was Captain Jesse's two volume Life of George Brummell (1844), the first biography devoted to him. In France there was the influential essay of Barbey d'Aurevilly, "On Dandyism and George Brummell" (1845), which seeks to define the essence of dandyism through a study of his career and opinions. In the course of his essay, Barbey d’Aurevilly deprecates English attempts to portray Brummell in fiction: "Within Brummell's lifetime two well-known authors took up their pen – sharpened to exquisite points and dipped in musk-scented Chinese ink – to cast on blue-tinted paper with silver borders a few facile lines where one catches a glimpse of Brummell." He was referring to two examples of the fashionable or silver fork novel, of which more than a thousand were to be written over the next two decades. The first such depiction is through the character Trebeck in Thomas Henry Lister’s Granby (1826), who abandons dandyism when he discovers a waistcoat of his devising worn by ‘a natty apprentice’. In Bulwer Lytton's 1828 novel Pelham, the hero of the title portrays a dandy who, at one point, passes through Calais and meets the inspiration of his way of life in the character of Mr. Russelton. The latter is modeled on Brummell and to him are attributed such stories from the Brummell apocrypha as his once needing three tailors to contribute to the making of his gloves and the sartorial insult "Do you call this a coat?" Brummell appeared under his own name as a character in Arthur Conan Doyle's 1896 historical novel Rodney Stone. In the novel, the title character's uncle, Charles Tregellis, is the center of the London fashion world, until Brummell ultimately supplants him. Tregellis's subsequent death from mortification serves as a deus ex machina in that it resolves Rodney Stone's family poverty. In the United States, Brummell's life was dramatised in an 1890 stage play in four acts by Clyde Fitch with Richard Mansfield as Brummell. This in turn was adapted for the 1924 film Beau Brummel, with John Barrymore and Mary Astor. Another play about Brummel, authored by Bertram P Matthews, is only remembered because it had incidental music written for it by Edward Elgar. When it was staged at the Theatre Royal, Birmingham in November 1928, Elgar himself conducted the orchestra on its first night. With the exception of the minuet, Elgar’s orchestral score subsequently disappeared and the manuscript has never been located. Brummell's later years were the setting for Ron Hutchinson's 2001 two-character play The Beau (originally Beau Brummell), which following a UK national tour played for one month at Theatre Royal Haymarket, starring Peter Bowles as Brummell. Earlier movies included a 10-minute film by the Vitagraph Company of America (1913), based on a Booth Tarkington story, the 1913 Beau Brummell and his Bride, a short comedy made by the Edison Company. In 1937 there was a radio drama on Lux Radio Theater with Robert Montgomery as Brummell. A further film, Beau Brummell, was made in 1954 with Stewart Granger playing the title role and Elizabeth Taylor as Lady Patricia Belham. There were also two television dramas: the sixty-minute So war Herr Brummell (Süddeutscher Rundfunk, 1967) and the UK Beau Brummell: This Charming Man (2006). In 1931 there was a French three-act operetta, Brummell, composed by Reynaldo Hahn to a libretto by Rip and Robert Dieudonné. This featured Brummell as the main character in a fabricated story of a rural courtship which saw occasional performance in later years. This was later broadcast by Radio-Lille (1963). T. S. Eliot's poem about "Bustopher Jones: The Cat About Town" refers to him as the "Brummell of Cats", an allusion taken up in Andrew Lloyd Webber's Cats, the 1981 musical based on Eliot's Old Possum's Book of Practical Cats (1939). Other allusions to Brummell appear in the lyrics of such songs as "All I Need Is The Girl" from the 1959 musical Gypsy and Billy Joel's 1980 hit "It's Still Rock and Roll to Me". In the song "You're Never Fully Dressed Without a Smile" from the musical Annie, the orphans sing the line "Your clothes may be Beau Brummelly, they stand out a mile". In the late 1920s, the touring ensemble Zack Whyte and His Chocolate Beau Brummels recorded for Gennett, Champion, and Supertone Records. In addition, Brummells' name was adopted by rock bands in the 1960s: the early San Francisco band The Beau Brummels and Beau Brummell Esquire and His Noble Men, the name used by South African born Michael Bush for his English rock group. ^ "No. 13773". The London Gazette. 25–28 April 1795. p. 379. ^ "Chesterfield Street". Daily Telegraph. ^ Campbell, Kathleen (1948). Beau Brummell. London: Hammond. ^ Romantic Circles, 'Fictions of Byron"
^ "Bowles Closes Early in Hutchinson's Beau, 23 Jun". WhatsOnStage.com. 8 June 2001. Archived from the original on 10 December 2013. Retrieved 5 December 2013. Wikimedia Commons has media related to Beau Brummell. "Brummel, George Bryan" . The American Cyclopædia. 1879.